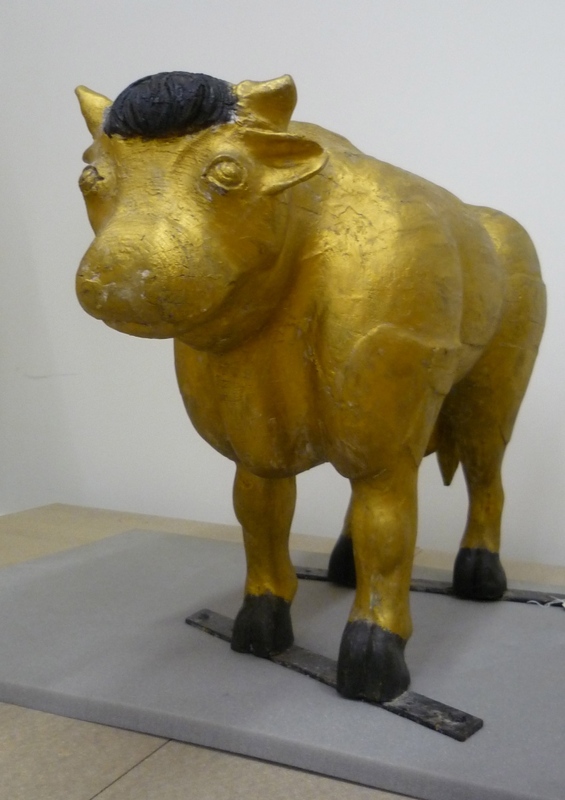 Our object of the week is this golden bull, which adorned John Bull’s Jewellery and Silversmith’s at 49 High Street, Bedford. 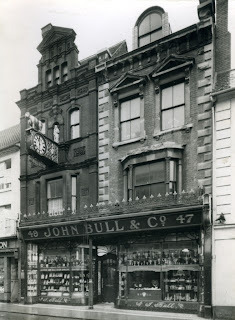 John Bull’s was established in 1817. 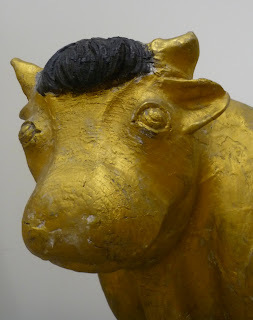 Today you can see a replica of the bull above the old shop. A golden bull and a clock were commissioned by John Bull’s sons in 1870 following a major refurbishment of the shop. It was designed to be an innovative piece of signage to get the shop noticed and to be symbolic of the company name. Later, in 1884, a golden ball was added that would drop and hit a bell at exactly 10am – it was triggered by an electrical signal sent from Greenwich and local people and travellers on the A6 would regularly set their own clocks by it. John Bull’s shop moved premises during the 1960s to St. Peter’s Street, where it is still open today. 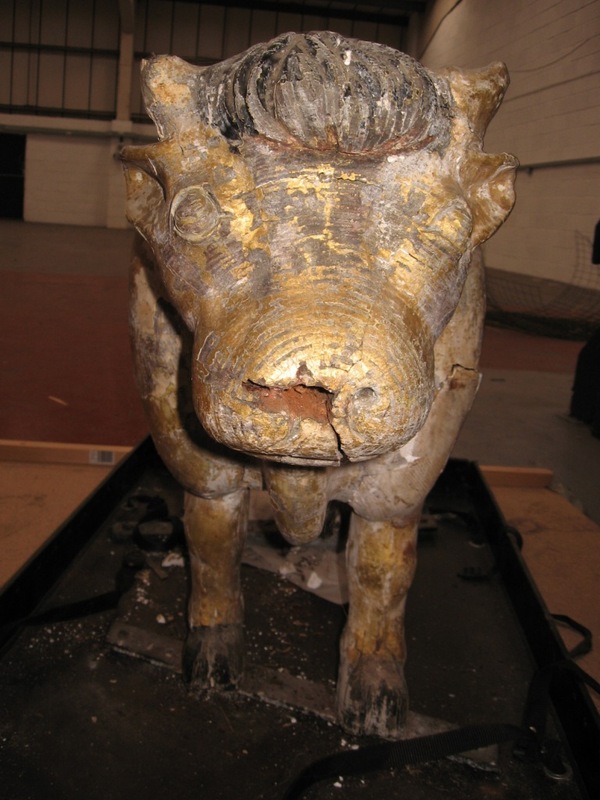 In 1974, the Council decided that, due to deterioration, the original bull should be taken down and it was at this time it came to the Art Gallery & Museum. It caused quite an outcry from local residents, who were obviously attached to this local landmark. Because of this, a replica was made to replace the original. The original bull was made from wood, so it is not surprising that it was rotting away due to weathering and required some attention. It has recently been restored by a conservator – you can see some ‘before and after’ pictures below. We’re looking forward to being able to display the golden bull when the Art Gallery & Museum reopen following the redevelopment project. In the meantime, do let us know if you have your own memories of the original John Bull clock and bull. You might also like to take a look at the Bedford High Street History Project blog and find out more about Bedford Central Library's recent project Half a Pound of Tuppeny Rice, Half a Pound of Treacle: Shopping in Bedford High Street, c.1800 – 1970.